With the holiday season fast approaching, you may be starting to search for the very best gifts money can buy to present to your nearest and dearest. If you're buying for a gaming fan, it's pretty likely that a Nintendo Switch-themed present could go down rather nicely indeed. 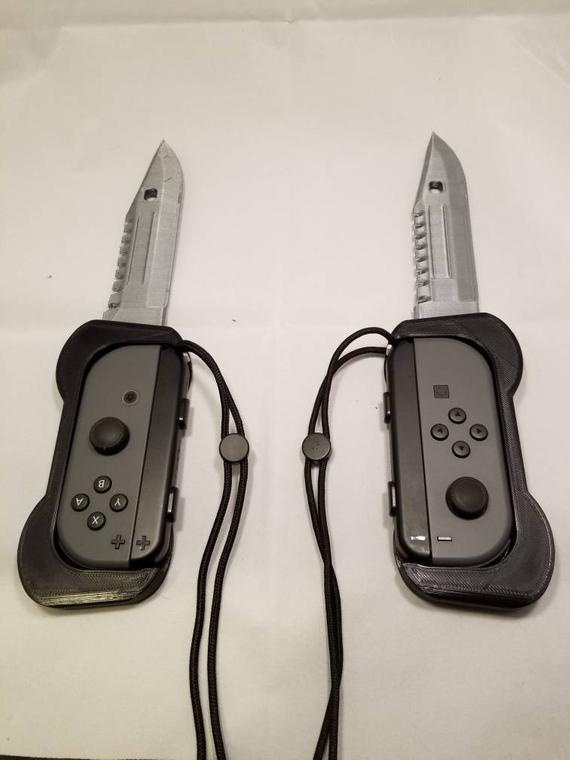 Well, as it happens, we've just stumbled across the perfect present for that very situation - because nothing says "Merry Christmas" quite like a set of Joy-Con knife blade holders. Yes, these controller grips are made to order, and are available to purchase right now from Etsy seller Inceptualize3D. The blade that you'll receive isn't actually sharp (it's there for the appealing aesthetic only) and the whole product is 3D printed using PLA plastic. 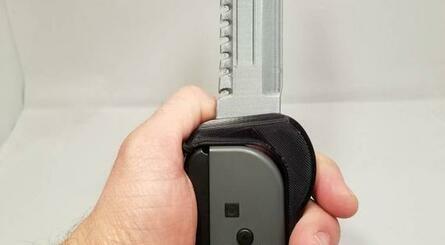 It actually comes in two pieces, so you're free to attach the blade to the grip, or leave it off entirely. We have spotted one cause for concern with the product, however, relating to the seemingly upside-down nature of the design. We haven't tested the product ourselves, but it does seem like the blades would dig into your stomach or legs if you were hoping to use the Joy-Con in a happy game of Super Mario Party or the like. Still, when the product description states "u may ask why? But you should be asking why not?? ", you can't really argue. If you're interested, you can grab them from Etsy for just $15 plus shipping. Will you be treating yourself or a loved one to these Nintendo Switch accessories? Where would we be without 3D printing, huh? Who's ready for a knife fight! I like where this is going. I want my hidden gun Switch now. Just in time for Mario Party! Let's not give this any more air time. Missed opportunity, 1 should say Jets and 1 should say Sharks. 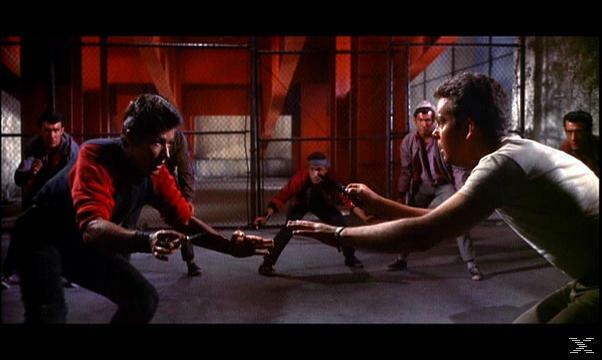 Maybe they are saving those for the West Side Story Switch bundle. @ThanosReXXX For me, this might help me get through Brexit. 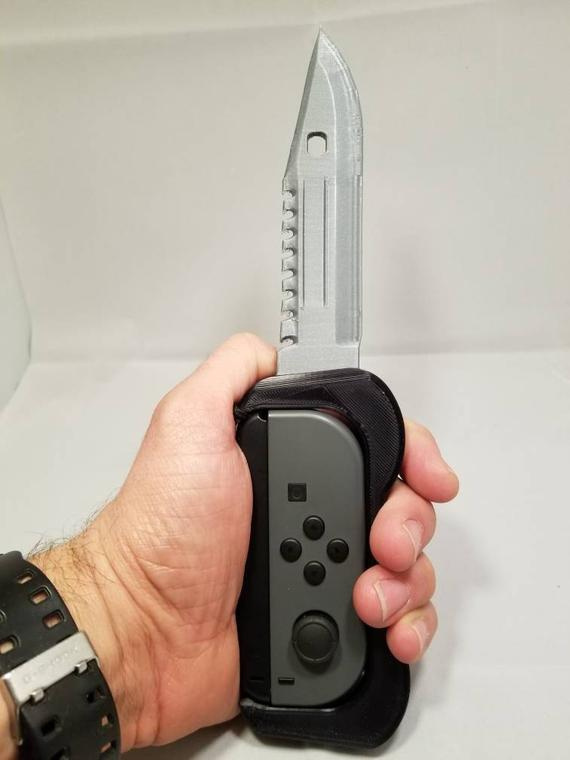 I personally feel knives strapped to my Joy-Cons will protect me from the economic collapse of the UK and the 90 year old botox-filled living dead that are the core Brexiteers. "Still, when the product description states "u may ask why? But you should be asking why not?? ", you can't really argue." "Where would we be without 3D printing, huh?" Sorry can't understand this obsession with knifes... One would expect that our species has already move passed this things by know. @ThanosReXXX it's not really a "company" in the traditional sense. It's from an Etsy shop. 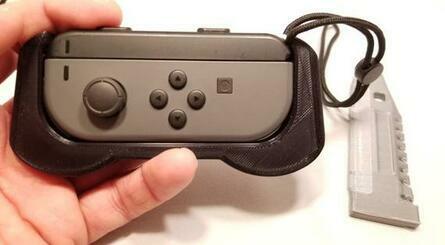 Toldja Joy-cons were cutting edge technology. is this real life? or just fantasy? I feel uneasy about this article. This is the most entertaining article I’ve read for a while. Terrifying, yes; but entertaining. I therefore eagerly await the first commenter to say, ‘Slow news day.’ That original and amusing line. I thought the image was just a meme, not a real product. @tangram @ThanosReXXX This is a party gag guys come on, not meant to be taken seriously, and something you buy and show off for a quick laugh with some close friends. It’s absolutely hilarious and I cracked up the moment I saw the thumbnail. Bad idea. Then you won't be able to take it on an airplane. What's the point of having a Switch then? @MaSSiVeRiCaN Well, I'm not laughing, because it isn't funny. Nothing to do with connecting kid's minds to weapons in any way, shape or form, is funny. Perfect for Resident Evil games. We just need Capcom to bring some more of it on the Switch. @ThanosReXXX all you need to know is that anyone can make one and sell anything as long as it's not illegal. It's not a company trying to satisfy consumers, it's some person who decided to 3d print a silly design and sell it on the internet. Not saying it's not dumb though. Still more useful than that daft Switch lock that was promoted on here yesterday. What about the children?! Has anyone thought of the children?! These plastic knives are a gateway to a life of crime! If only we could create laws against horrible things like this! These plastic knives will doom us all! @nessisonett That comment is like one of the low rated troll posts on the Daily Mail. @Balladeer I'm actually amazed that no one has said that so far. It's usually impossible to post any kind of tongue-in-cheek article without that phrase being plastered throughout the comments! We need more articles like this! @ThanosReXXX I'm sorry I thought u were an adult. This isn't for kids. @Yosheel Yeah, so it's kind of an online market for individuals to sell their product. Like eBay or whatever example. I'm not really into these kinds of things, so there's a lack of knowledge there on my part. @MaSSiVeRiCaN I'm 48, thank you. Just mindful of more people other than myself, is all. Well done !!!!! Enough people bang on about video games causing people to be violent !!! They'll have a field day with these. @ThanosReXXX I'm in total agreement. Irresponsible putting this on this website I fear. What next? @GrailUK @ThanosReXXX man sorry again I took your comment too literal. I guess it's just a different sense of humor we have. Seriously though I just sent this to like five of my friends and they all cracked up. The fact that it’s a product with a family friendly image is what makes this funny, I’m genuinely surprised you guys would take offense to something that is clearly meant as a joke for adults. @MaSSiVeRiCaN No worries, man. I can take a few punches here or there. I was semi-serious, though, to be honest. Not so much due to the fear of violence, but more because I simply think it is completely useless, in that it doesn't do or add anything, other than adding an appendage to a controller. @bluedogrulez I guess from a gameplay perspective it makes more sense to have the knife going the wrong way. 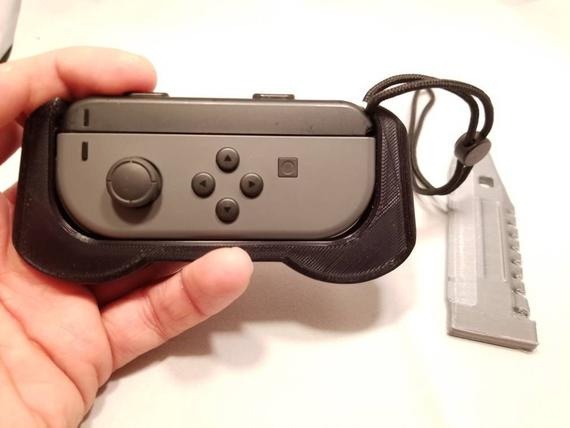 Take a joycon and try to use it sideways, it's easier to hold it when the plastic blade is on the side with the long gap. ...Somebody was going to do this. 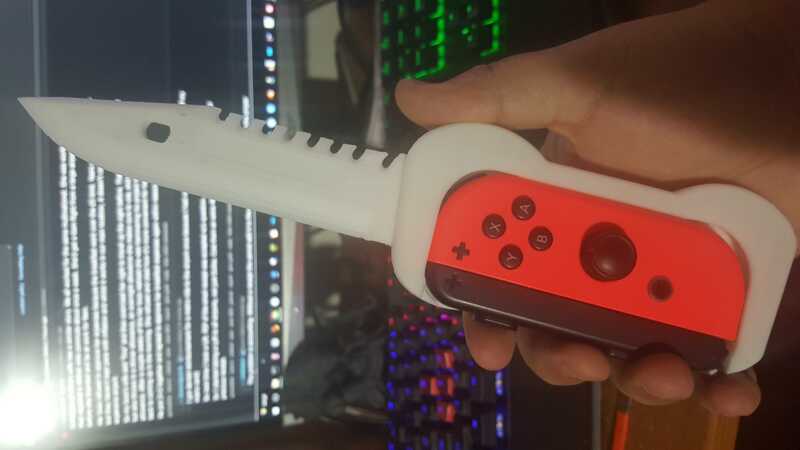 I have a feeling that airport security would end up confiscating my joycons if I had this. No thanks! @tangram "Sorry can't understand this obsession with knifes... One would expect that our species has already move passed this things by know." ......Our species that survived by sharpening a stone into a point. Not sure if serious. Anyway, maybe the design is to keep shoulder-lookers out of your space while playing Call me when a new Freddy Powerglove comes out. These are safety measures for anyone that plans to play their Switch in public in the UK, lol. @tangram Well, there's some vagrants that are very hairy and agressive at the Quik Mart. I'd rather someone have a knife for no valid reason than a firearm for no valid reason. Though I live in the south and don't know many folks that carry either around. Oof, clearly for novelty only. If you require a knife for any sort of stabbing or thrusting motion, you will hurt yourself badly. You won’t be holding a real joy con any time soon at least. I love how when you hold the joycons in the correct orientation it results in you holding the "knife" combat style. Why not? 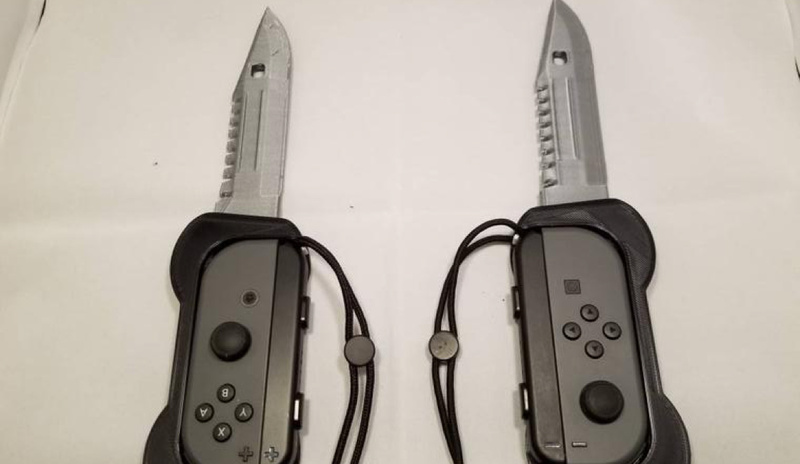 Well because there's no need to have knife blades on your Joy-Con whatsoever, nor is there a reason you would ever want Joy-Con on your knives. This is really great though. Before, we could only sit on the toilet and play Skyrim. But now, we can actually enable motion controls to be able to take on a Lv80 Dremora Lord all while chopping ingredients for dinner with your Switch, the only console that goes with you from cutting board to table to toilet to bed! @HobbitGamer Even if you detour through the 'hood. So the ideal Super Mario Party joy-cons to play with the ones you hate. They truly think of everything. I think it's in pretty poor taste considering the state of knife crime in our cities at the moment in the UK. 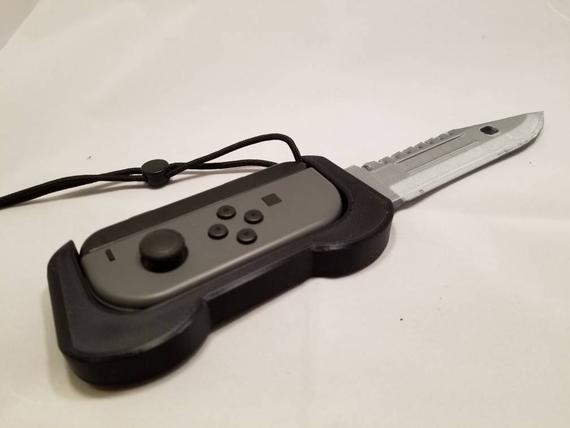 A Microtech Ultratech inside of a joycon would be neat as hell. @RandomLeo00 “just in time for Mario Party” I laughed so hard at this! 1-2 Switch has become a whole new level of a drinking game now. Real knife blade or no interest! These joycons come packaged along side the new release, 1-2-Stab. 1,2 switch is now worth it. Never bring a knife to a gun(star) fight. 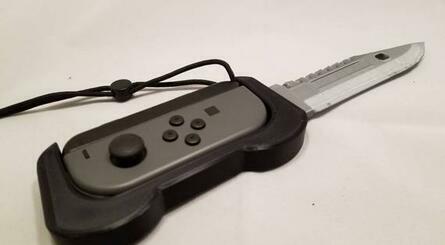 Is this what you call a switchblade? 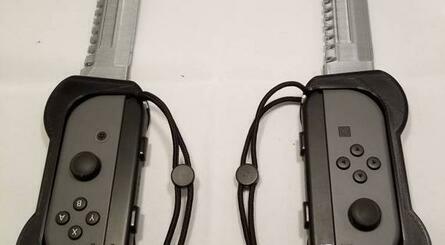 Meh; call me when someone starts selling a Javelin CLU Joycon holder and then I may bite. @ThanosReXXX detected by radar,? It's have to be a pretty big gun buddy to be detected by radar. @Kalmaro Not before my Double Barreled Kongo Drum Guns! @MarzipanD Ah, yes... those were funny, back in the day.